Is it possible to stay classic but still have a little fun? 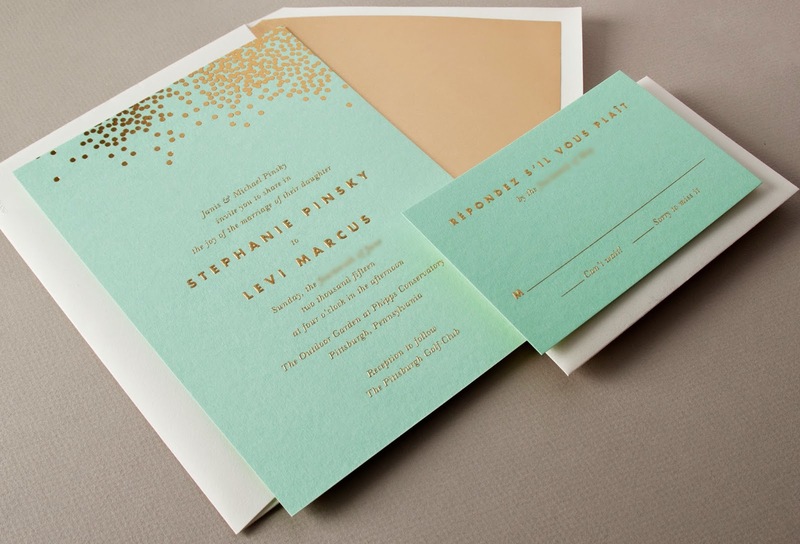 Stephanie and Levi answered that question with a resounding “yes” when with the help of their stationer—Nota Bene in Pennsylvania—they chose a mint and gold Vera Wang wedding invitation. 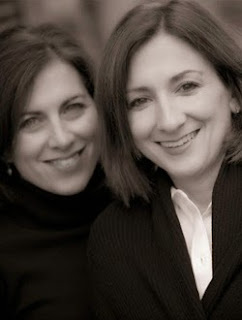 Below, both Stephanie and Nota Bene’s Amy talk about the importance of having an open mind, knowing that flowers just may turn into confetti—and that’s totally okay. 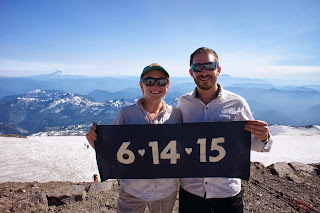 Tell me how you and your fiance met, and how did he propose? Levi and I met at a local coffee shop and then “pretended” to run into each other there for the next five days until we finally went on our first date. 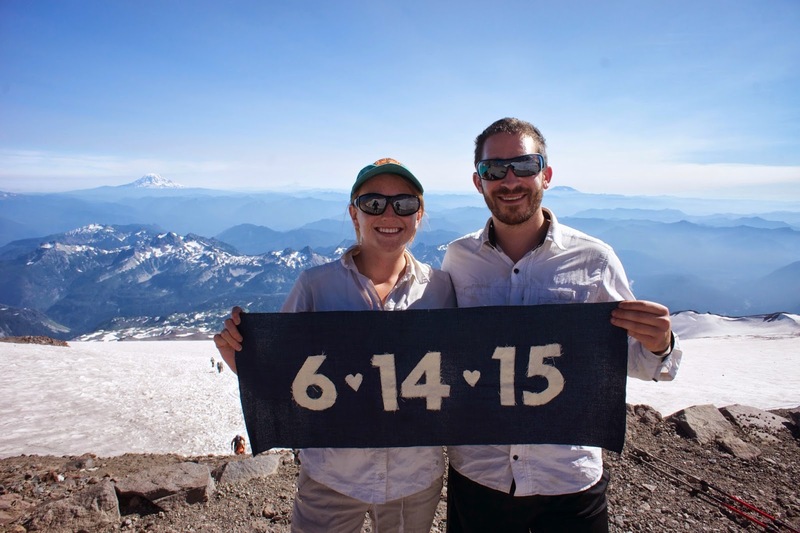 He proposed three years later on New Years Eve in New Orleans. Describe the invitation you ended up with and why you fell in love with that design. I fell in love with the Vera Want Gold Confetti in Mint because I wanted a strong design that wasn’t overwhelming. This suite is modern and fun but still classic enough to appeal to a broad range of taste. I also knew I could not go wrong with such a great color combo! I knew I wanted to incorporate gold into our invitations, but I was convinced I wanted to have a flower design as well. When I saw the Vera Wang invitation I fell in love with it but got cold feet because it was not what I originally wanted. Finally, after searching for weeks I went back to the Vera Wang suite and could not be happier. I should have trusted my gut from the beginning! I was not expecting to be so overwhelmed with other wedding planning activities while I was working on the invitations. For example, the invitations arrived the weekend of my bridal shower and needed to be mailed the next day! Luckily Nota Bene was able to print envelopes, assemble and mail the invitations without having me come in! The day after my shower, my own invitation arrived in the mail. What a lifesaver! I was so grateful to have the support. Go with your gut and don’t overthink things. Putting on my wedding dress for the first time. We looked at many things before deciding on this one. Sometimes brides come in and know exactly what they want, but many times brides come in and have no idea until they see it, and then they know. Stephanie knew what she didn’t want and liked different parts of several invitations. She liked color, non-traditional and somewhat whimsical. She also valued the opinion of her fiancé, so after some time and additional online research she decided on the Vera Wang invite. I ask them many questions, just to see if I can try and narrow down the search. Do they have any idea of what they are looking for? Have they already looked online or seen something they liked? Are there colors they are trying to incorporate? A certain style? Ribbons? Pockets? Layers? A specific printing process? Then I try to give them a quick tutorial and, most important, budget. Most do not have any idea what invitations cost, but I also hate for a bride to fall in love with an invitation that is completely out of their price range, so I try to give price ranges as I show them different invitations. We are definitely seeing a return to the traditional wedding invitation: black ink on ivory paper, but using a great script font and envelope liner. 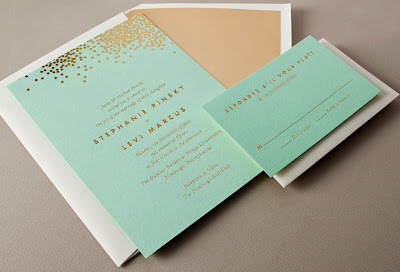 Also, we love letterpress and so do our brides, along with gold, copper, silver and rose colored foils. Come in open-minded, because often what you think you want isn’t always what you end up getting—there are so many options out there. Also, be flexible, because you see these elaborate invitations in boxes with brooches and ribbons, but they are expensive and may be out of your budget. Try to come in with a rough idea of quantity: remember, it’s number of invitations—not people—and some idea of budget. Thanks to Pinterest and various websites, the bride is exposed to so much more. Fortunately, we have a wide variety to choose from, so I think we are able to meet the customer expectations! And our vendors are doing a great job of keeping up with all the latest trends.